New observations show that Ceres, the largest body in the asteroid belt, does not appear to have the carbon-rich surface composition that space- and ground-based telescopes previously indicated. Using data primarily from NASA’s Stratospheric Observatory for Infrared Astronomy, SOFIA, a team of astronomers has detected the presence of substantial amounts of material on the surface of Ceres that appear to be fragments of other asteroids containing mostly rocky silicates. 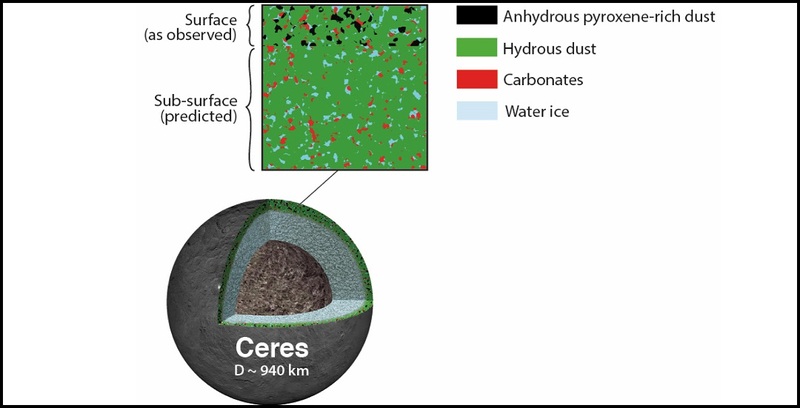 These observations are contrary to the currently accepted surface composition classification of Ceres as a carbon-rich body, suggesting that it is cloaked by material that partially disguises its real makeup. “This study resolves a long-time question about whether asteroid surface material accurately reflects the intrinsic composition of the asteroid,” said Pierre Vernazza, research scientist in the Laboratoire d’Astrophysique de Marseille (LAM–CNRS/AMU). Our results show that by extending observations to the mid-infrared, the asteroid’s underlying composition remains identifiable despite contamination by as much as 20 percent of material from elsewhere,” said Vernazza. Astronomers have classified the Ceres asteroid, as well as 75 percent of all asteroids, in composition class “C” based on their similar colors. The mid-infrared spectra from SOFIA show that Ceres differs substantially from neighboring C-type asteroids, challenging the conventional understanding of the relationship between Ceres and smaller asteroids. Ceres and asteroids are not the only context where material transported from elsewhere has affected the surfaces of solar system bodies. Dramatic examples include Saturn’s two-faced moon Iapetus and the red material seen by New Horizons on Pluto’s moon Charon. Planetary scientists also hypothesize that material from comets and asteroids provided a final veneer to the then-forming Earth that included substantial amounts of water plus the organic substances of the biosphere. To identify where the pyroxene on the surface of Ceres came from, Vernazza and his collaborators, including researchers from the SETI Institute in Mountain View, and NASA’s Jet Propulsion Laboratory, both in California, turned to interplanetary dust particles (IDPs) that form meteors when they are seen streaking through Earth’s atmosphere. The research team had previously shown that IDPs blasted into space by asteroid collisions are an important source of material accumulated on the surfaces of other asteroids. The implication is that a coating of IDPs has caused Ceres to take on the coloration of some of its dry and rocky neighbors. This study was published January 16, 2017 in the Astronomical Journal. NASA is exploring the solar system and beyond to better understand the universe and our place in it. We explore asteroids and comets, which may hold clues about the history of our solar system and how life arose on Earth. SOFIA is a Boeing 747SP jetliner modified to carry a 100-inch diameter telescope. It is a joint project of NASA and the German Aerospace Center, DLR. NASA’s Ames Research Center in California’s Silicon Valley manages the SOFIA program, science and mission operations in cooperation with the Universities Space Research Association headquartered in Columbia, Maryland, and the German SOFIA Institute (DSI) at the University of Stuttgart. The aircraft is based at NASA’s Armstrong Flight Research Center's Building 703, in Palmdale, California.